Organisms require a successful relationship with their environment in order to survive. They have to obtain energy and nutrients effectively from their surroundings, conduct their own life processes, and get rid of metabolic wastes. Plants require sunlight and water for photosynthesis. Fungi will only grow in areas where they can digest and absorb nutrients. Animals need to consume food. Protists and bacteria are all dependent on their environments in some way for nutrients. The wastes that organisms produce become part of the environment, and may impact their own survival or that of others at some time in the future. These considerations are part of the branch of biology called ecology. Ecology includes all the interactions of organisms with their environments. 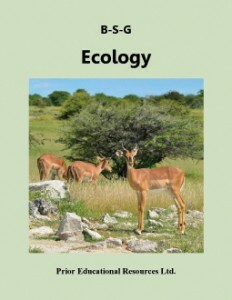 The Ecology study guide unit introduces several concepts that are fundamental to an understanding of ecology. It starts with succession, then considers food chains, food webs, and energy flows through ecosystems. It includes a discussion of the interdependence between photosynthesis and respiration, dynamics of population biology, and finally interactions between populations. Ecology is excerpted from our Biology 11 Study Guide, which is the fourth edition of a student study guide written to match the curriculum of British Columbia. The concepts presented are applicable to the biology curricula of other educational jurisdictions as well.